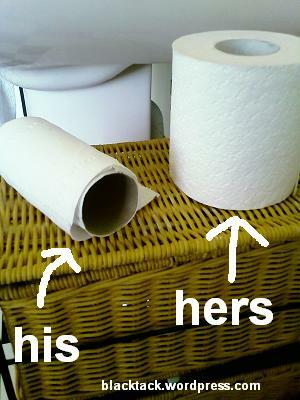 Following a trip to Tesco last week, we now run our household on a “two toilet roll” system. Kirstie saw the Andrex (“A little softer, a little thicker… A little luxury”) Quilts and couldn’t resist. So now we have two toilet rolls. His and Hers. I have to admit. I’ve tried some. And the problem is, its a little too thick. A bit like using the fancy stationery in Paperchase. The hand-pressed stuff they have upstairs. The other problem with this is that we can now measure accurately our relative bog roll use. I try not to think about it. But it’s there. We’re currently spending our free time looking for a new television set for the house. This is an area I happily admit that I am a bit too fussy. Although it has been Kirstie who is most vexed with our current TV arrangements. All she wants, all she’s ever wanted, is to be able to come home, press a switch and for the TV to work. So what we’ve got at the moment, is a collection of small portables around the house, which are all hooked up in different ways. Kirstie’s eyes don’t just glaze over when I explain why the Freeview box needs turning off and on again, or what may cause the interference to the videosender for the box in the kitchen… They turn angry. I think it’s a frustration that most women have with men. Why can’t we keep things simple? A really easy to use portable – which isn’t the focus of the room – which supplies television instantly – without ever the need for more than one remote control. But I thought we’d get closer to solving our tv problems by going out to buy a new one for the living room. I started off looking at the 42 inch screens. Apparently, this is too big and unnecessary. I tried arguing the point, and even pitching a romantic scene where we could snuggle up, and turn our lounge into our very own home cinema. “The people’s heads can’t be bigger than ours. I don’t want to be watching EastEnders, and have their faces all bigger than mine. Come on, that’d be a terrible thing to get through”. And, you know, she’s right. So it’s now our only guiding rule in looking for a screen, – which unfortunately pushes us towards the 32 inch models. I would feel completely emasculated. I have, after all, lost 10 inches. But I think we’ve gained a good compromise… and neutralised the potential threat of Kate Thornton’s giant square face bearing down and scaring us one night. How Long Does It Take To Make A Sofa, Anyway??? We’ve bought a new sofa for the new house. Actually, we bought it at the end of February. This is it – in the store. The guy in John Lewis was really helpful (and even took my lame observation that it must be great having a job where you get to sit around on sofas all day with a good-humoured reaction that didn’t give away that he’d probably heard that a thousand times a month). But it was only after leaving the store that we realised we’d left on the sentence “Of course, it should be ready for delivery in 6-8 weeks”. Naturally. It’s something we all know – because sofas take 6-8 weeks to make, don’t they. Is this the only retail industry that makes things one at a time, once it’s been paid for? Like a burger order in a Wimpy restaurant? I don’t get it. They only make them in 3 colours. Would it kill them to… I don’t know… make just one extra? Someone’s gonna buy it. Aren’t they? That person will be delighted they’re not going to wait 6-8 weeks to get it, and the sofa factory can get on with getting another one ready. Maybe that’s the reason why. It’s pretty unlikely that a sofa factory ever gets repeat business. (It’s a fact that your average sofa factory is never going to get repeat business). Once you get it – that’s it – they’re pretty much around for life. Like this one. We needed something so we’re not sitting around on the floor for the next two months. We were down at the local tip and saw this beauty. But we didn’t have to wait 6-8 weeks for it. Today I’m saying goodbye to a couple of dear old friends. 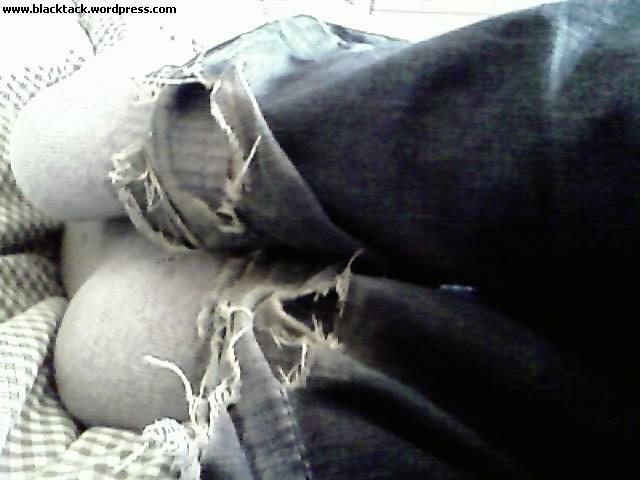 They are my two pairs of jeans which I don’t think I’ve had that long. I’d say only two years in my head. But I suspect in Denim years it equals about four. They never fitted me particularly well, but they were comfortable and were always there for me. Take a closer look and you’ll probably spot why she hates them. (You can click on the pictures to get the full blown glory). These are the ones I had to ditch recently. They look alright. But Kirstie’s problem is round the back. And when she tried to explain why I should get a new pair she called the dangly bits “dags”. It’s probably the best noun possible to describe these hanging bits, and really made me think about how many wet pavements and public toilet floors I’ve dragged them through. God knows how much bacteria I’ve mopped up in those babies. The other has a tear in one leg right up to the top of my ankle. (Kirstie would say ‘calf’). Which, being 35, obviously I thought was vaguely ‘in’. But I never get to see this rear view, and didn’t realise quite how uneven they are… In fact, I’m slightly shocked. 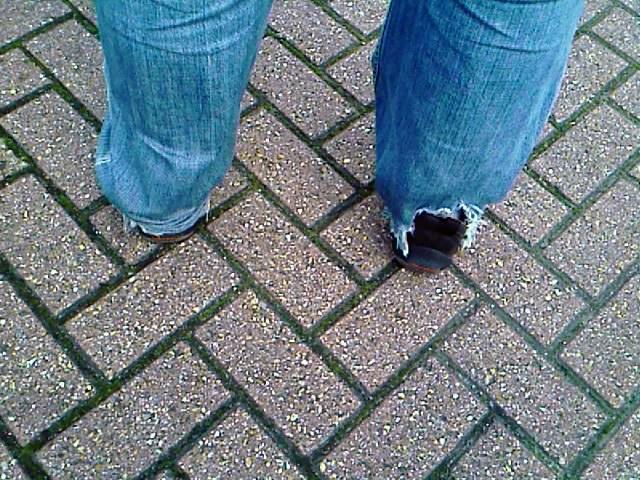 I’d try talking Kirstie round that this is just the style at the moment: all jeans look like this. But look – the label – see, ‘relaxed fit’. OK, so some of the tears are placed a little more unfortunately than others. I’ve never needed my jeans to offer any support down there. (And I’d never again get myself in the position for this pose). 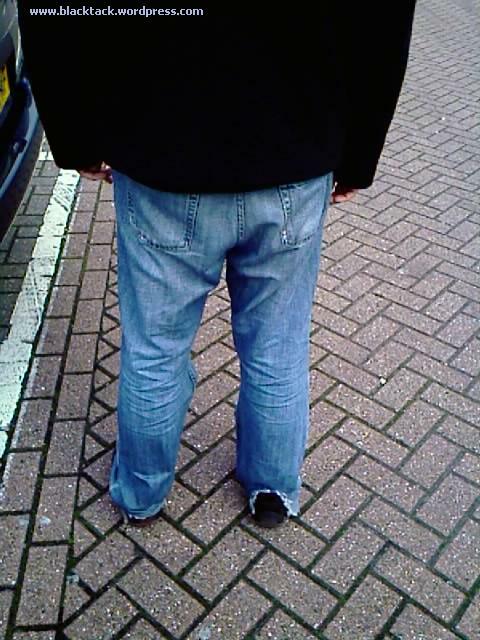 But these are my ‘good’ jeans. The ones I practically live in. So, anyway, the photos swung me finally into going jeans shopping. So I got the new jeans. Two pairs. Which don’t drag on the ground. Imagine my joy when I had to pull this label out of both of them.